When it comes to eating food repetitively, I think there are two types of people. Those who are totally fine with it, and those who can’t face the same food too often. My parents fall into the first category. They both have a habit of finding a food, cuisine, style of cooking, spice, or some other food they enjoy. Then they cook it. And cook it. And cook it again. And so many more times that people like me want to scream at the sight of the repetition. Personally, I need to vary my food. (I can’t imagine you’re shocked right now.) And while I definitely have old standby foods that I’ll fall back on, I’ll almost never eat the same food day after day after day. And when I do, you know that food is something special. 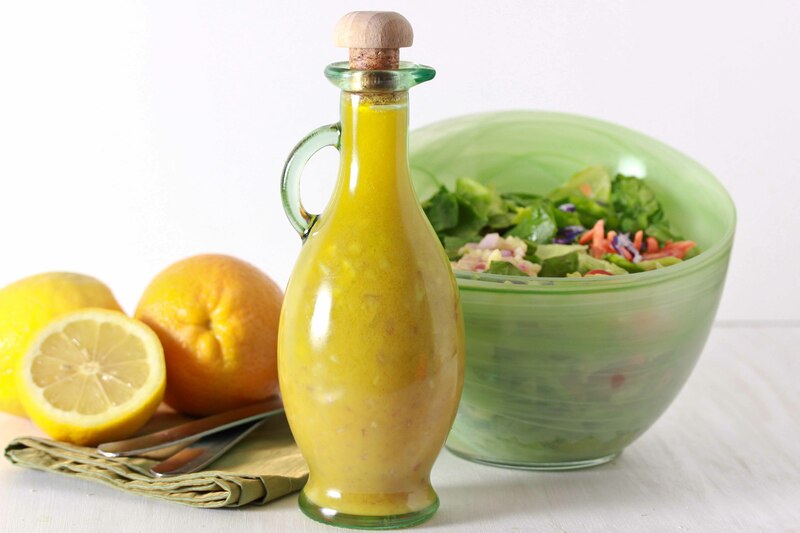 Which brings us straight to this delicious salad dressing. Special is definitely one of the words I’d use to describe it. Delicious is another. Simple and easy is another. Fresh, bright and healthy are also adjectives that will describe this beautifully. 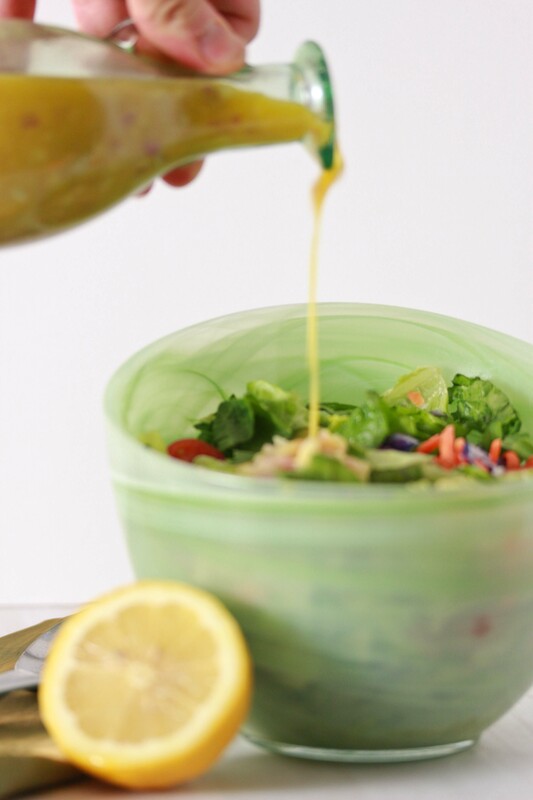 I made this delicious salad dressing one Sunday, and I had it for lunch every day that week. And then, when I ran out, I made some more. It really is that good. Make it. You’ll see. Just make sure you have enough, you’ll want to keep eating it. Whisk together the lemon juice, orange juice, oil, mustard and agave syrup in a bowl. Whisk until combined and slightly thickened. Add the shallots and stir to combine. Salt and pepper to your taste. About how many ounces is the juice of two oranges? Lemons? Thanks! This sound delicious; thanks for posting it! Squee, this is gorgeous. Love it and must try it immediately. Beautiful pictures. And I love that salad bowl! about how many tbsp of lemon juice and oj for the lemon and orange? also what salad would u recommend this dressing for? what kind of mustard? dijon? deli? thanks! I used plain yellow, but I’m sure those would be delicious too! Love this recipe – it has the same “build us up without weighing us down” idea as our Summer Salad Suppers class! Thank u for this recipe. Can’t wait to try it even tho it’s winter here. Yum! I’m always looking for new ways to spice up salads (as yes, I’m in the ‘new foods required continuously’ category!!) and this dressing sounds divine. I can even imagine it drizzled over chicken or a tuna salad. Actually, everything! Thanks for the recipe. Can I substitute onions or garlic (or a combination of onions and garlic) for the shallots? I don’t typically have shallots on hand. Sure, use a small onion! Hi can I use mixed greens for this salad or better romain lettuce? also, do you think i can add a mango? Yes and yes! 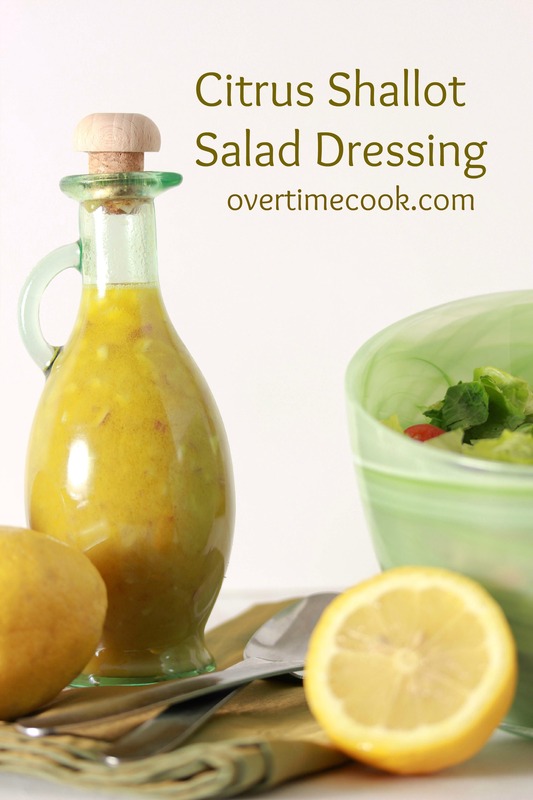 This dressing is very versatile! Hi, just wondering how long this would last….thinking of it as apart of a Christmas gift. I always use it to pretty quickly, but definitely a couple of days in the fridge would work. Is it okay to opt out the mustard ? It won’t be quite the same but I am sure it will still be delicious! I was a the bank when I saw this recipe. Kroger was right next door and I had to get olive oil and oranges. The rest I adapted with ingredients I had. Instead of lemons I had likes and I was out of honey, but I had some watermelon syrup I rendered a few weeks ago. I doubled the oil and it is a real treat! Do you think this would be a good salmon marinade? Hi is it possible to use lemon juice and oj instead of the fruits? And if so, measurements? I don’t have a juicer, thanks! Sure, you can use bottled. Please answer fully the above question, “measurements” for lemon and orange juices. What are the measurements for the lemon and orange juices?? Like it says in the recipe, it’s the juice of two of them. If you don’t want to use fresh squeezed, I am sure google can give you a good amount to sub. Please note though that freshly squeezed and bottled juices are NOT the same, and won’t yield the same results.